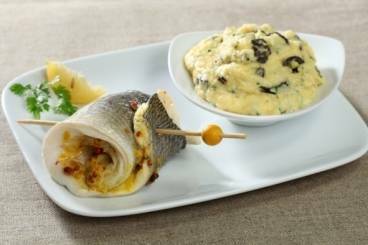 Steamed fillet of sea bream cooked with confit lemon and pink peppercorns served on a bed of creamy polenta. Trim the sea bream fillets and remove any pin bones. Season with fleur de sel and the pink peppercorns and then spread a small amount of confit lemon puree on to each fillet. Roll the sea bream fillets up and secure with a cocktail stick. Wash, pick and roughly chop the chervil. Cut the olives into quarters. Bring the milk to the boil and then add the polenta. Cook over a low heat until all the milk has been absorbed. Add the butter and the cream and mix well. Season with salt and pepper and then add the chervil and the olives. Bring a little water to the boil in the bottom of a wok. Place a grill or steaming tray above the water and add the sea bream fillets. Cover and cook over a low heat for 6 to 7 minutes. Serve the sea bream on a bed of polenta.